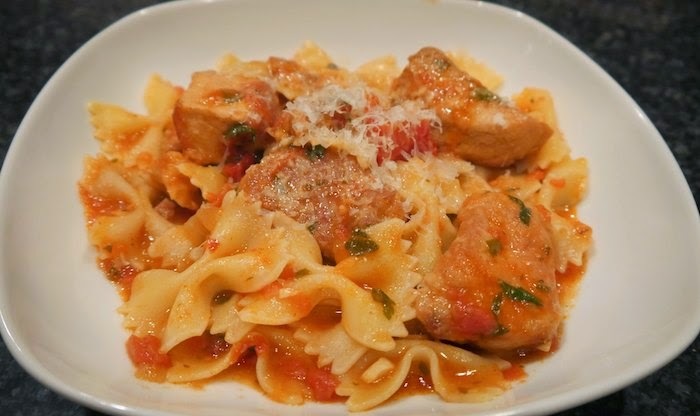 Fork tender pork that melts in your mouth is the base of this hearty Italian inspired meal flavored with fresh herbs. A cinnamon stick and some anchovies are also added to the simmering liquid, giving it yet another tasty dimension. The stew is perfect for those cold winter nights we are all experiencing right now. Serve it over pasta for a comforting family dinner. 1. Dredge pork in flour and shake excess. In a Dutch oven, brown pork in 3 tablespoons oil in batches. Remove and keep warm. 2. In the same pan, add garlic; cook 1 minute. Stir in the tomatoes, water, bay leaves, cinnamon, tomato paste, vinegar, anchovies, herbs, salt, pepper flakes, pepper and pork; bring to a boil. 3. Reduce heat; cover and simmer for 1-1/2 hours, stirring occasionally. Stir in parsley. Cover and cook 30-40 minutes longer or until meat is tender. Discard bay leaves and cinnamon. 4. Serve over cooked pasta; sprinkle with cheese. I love their prepared foods for lunch. I love their fresh seafood! I love the bulk section at Whole foods. I love the amazing produce and the bulk section!! I will get some meat or seafood - a splurge! Cheese. I love the cheese selection at Whole Foods. I wish we had a whole foods near us! This looks great! My husband would love this! And, I bet you could do this in the crock pot as well. Thanks for the recipe. Baby bok choy, and farro, and their biscotti, sold by the pound. Can't ever go wrong with Italian for dinner! That dish sounds fantastic! I love the spices and herbs you have added to it! I would buy something from the bakery area. With the cinnamon stick and the anchovies, there are so many layers of flavor in this. I'm very tempted to try this on the weekend! I am looking forward to buying some fresh bread from there bakery at whole foods market. This pasta looks so hearty and delicious! I love buying fresh meat at Whole Foods...yum! I love their smoothies, I'll definitely be getting one of those! I want to take my husband to lunch there. I would stock up on beans and grains. And maybe some fish. I'd love to buy some of their delicious cheese, what a selection! I really want to get some gluten free flours. I am not a huge pork fan, but this looks great. I may have to give this a go! I love Whole Foods produce! I spend the bulk of every visit there. Then we visit the cheese and bread. Followed on Instagram - ismilefirst. Maybe the produce, although it would be tough to decide. Didn't have to think about that one, cheese. This is a perfect 'comforting' meal. Perfect for a chilly January night! Some nice high quality protein, either wild seafood or perhaps some lamb!